TANZANIA’S parliament has passed amendments to legislation that give sweeping powers to a government-appointed registrar over political parties, a move that opposition legislators say will cement ‘one-party rule’. President John Magufuli’s government has already banned some newspapers, restricted opposition rallies and detained dozens of their members which, along with repeated state intervention in key sectors like mining and agriculture, have dimmed investment in the region’s third-biggest economy. The amendments give a government-run registrar sweeping powers to de-register parties and provide for up to a year in jail for anyone engaging in unauthorised civic education – for example, a voter registration drive. Critics say the amendments will sharply curb freedoms in the East African nation and prevent an effective challenge to Magufuli and the ruling Chama Cha Mapinduzi (CCM) party in next year’s general election and this year’s local elections. Opposition leaders said the legislative changes would effectively criminalise political activity and turn Tanzania into ‘a de facto one-party state’. ‘You can’t have a constitution that allows freedom of association then give someone powers to revoke that freedom of association,’ Zitto Kabwe, the leader of the opposition ACT-Wazalendo party, said in parliament late on Tuesday after unsuccessfully seeking a court injunction to try to block parliament from passing the law. Another opposition MP, Esther Bulaya, said the legislation would give the registrar of political parties ‘excessive powers’ to interfere with internal affairs of political parties, including stripping individuals of party membership and removing them from leadership positions. But ruling party lawmakers say the amendments give the registrar much-needed authority to act as a referee and ensure political parties do not embezzle subsidies from taxpayers and that they hold transparent internal leadership elections. Tanzania, a nation of 57 million people, has long been regarded as one of Africa’s most stable democracies. The ruling CCM party, and its predecessor TANU, have governed since independence from Britain in 1961. 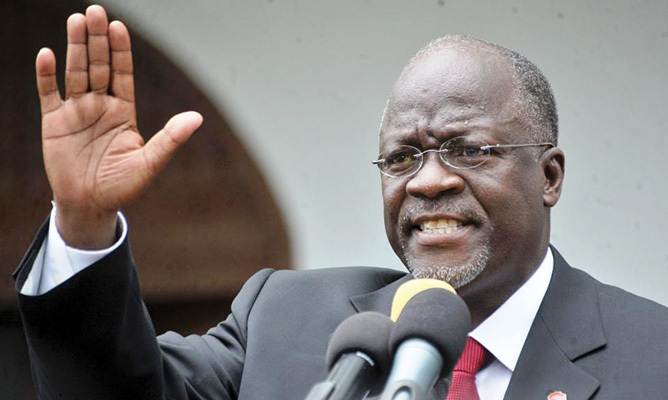 Magufuli, 59, was elected in 2015. He is been nicknamed ‘The Bulldozer’, partly for his pugnacious management style. His government’s curbs on freedom of expression have drawn criticism from Western donors who provide hundreds of millions of dollars annually. Some have suspended loans or aid. The legislation was aimed at enhancing transparency and accountability, said Jenista Mhagama, the minister of state in the prime minister’s Office responsible for parliamentary affairs. The Political Parties Act being amended was passed in 1992 when Tanzania adopted multiparty politics. ‘This legislation has already been amended seven times since its enactment … with the objective of strengthening multiparty democracy in the country,’ Mhagama told parliament. Previous articleIs the CFA franc stunting development in francophone Africa?